At Pediatric Dermatology of Miami, Dr. Mercedes E. Gonzalez and her professional support staff provide exceptional care for you and your family. From the time you make your appointment until you walk out the door, you will receive attentive service and individualized care from all of our healthcare professionals and staff. To schedule an appointment, call our South Miami, Florida pediatric dermatologist at (305) 667-3152 or request an appointment online. 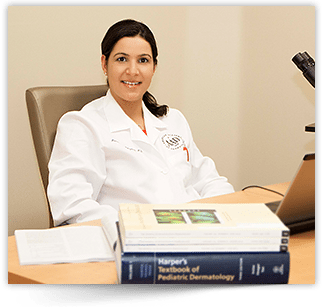 Dr. Gonzalez loves pediatric dermatology and enjoys explaining the skin and skin disease to her attentive patients and their worried parents. If you meet her in the exam room, you may find her drawing on the paper table sheet or using her intertwined hands to describe how skin cells are like the bricks of a wall.